Summer is officially in full swing. Fill your days with trips to the beach, lazy days (or songs), sunny skies, new adventures and, of course, lots of cooking! This July, Parties That Cook is offering an Indian Summer Tapas cooking class. 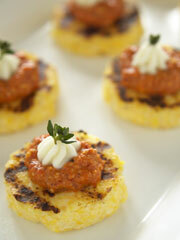 And this week, we’re featuring one of the recipes from the class’ small plates menu. Make Filling: Peel potato and dice into 1/4-inch cubes. Blanch in boiling water for 1-2 minutes, or until tender but still firm. Drain and set aside. Heat the ghee or oil in a skillet and add the potatoes, asafetida powder, mustard seeds, peas, jalapenos and salt. Stir well over moderate heat for 2 minutes. Cover pan, reduce heat and cook gently for 7 minutes. Remove from heat and add the garam masala and chopped cilantro. Cool in refrigerator for a few minutes. Assemble Samosas: Put 6 won ton wrappers on a dry surface and brush lightly with water, focusing on edges. (Leave remaining wrappers in package, covered with a damp towel to prevent drying.) Mound about 2 teaspoons of filling in the center of each wrapper. Fold one point over to meet the other to form a triangle. Press edges together to seal. Place on a tray dusted lightly with cornstarch. Repeat process with remaining wrappers. Fry Samosas: In a large frying pan, add 4 cups canola oil and heat to 360°F. Working in batches, fry samosas until golden brown, about 1 minute per side. Using tongs, transfer samosas to cooling rack over a sheet pan. Blend Chutney: Blend all ingredients in a blender until smooth. 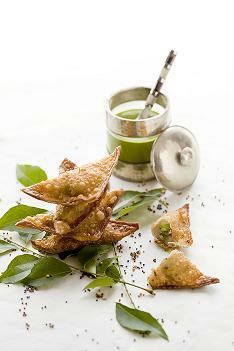 Pour chutney into a small bowl.Serve: Serve samosas on a platter with chutney.